Not to be confused with Uzi Geller. Uri Geller (/ˈʊri ˈɡɛlər/; Hebrew: אורי גלר‎; born 20 December 1946) is an Israeli illusionist, magician, television personality, and self-proclaimed psychic. He is known for his trademark television performances of spoon bending and other illusions. Geller uses conjuring tricks to simulate the effects of psychokinesis and telepathy, though he consistently claims his powers are real. Geller's career as an entertainer has spanned more than four decades, with television shows and appearances in many countries. Geller was born on 20 December 1946 in Tel Aviv, which was then part of British-administered Mandatory Palestine. His mother and father were of Austrian-Jewish and Hungarian-Jewish background respectively. Geller is the son of Itzhaak Geller (Gellér Izsák), a retired army sergeant major, and Margaret "Manzy" Freud (Freud Manci). Geller claims that he is a distant relative of Sigmund Freud on his mother's side. At the age of 11, Geller's family moved to Nicosia, Cyprus, where he attended high school, the Terra Santa College, and learned English. At the age of 18, he joined the Israeli Army's Paratroopers Brigade, with which he served in the 1967 Six-Day War and was wounded in action. He worked as a photographic model in 1968 and 1969; during that time, he began to perform for small audiences as a nightclub entertainer, becoming well known in Israel. Geller gained notice for demonstrating on television what he claimed to be psychokinesis, dowsing, and telepathy. His performance included bending spoons, describing hidden drawings, and making watches stop or run faster. Geller said he performs these feats through will power and the strength of his mind. Magicians and sceptics have noted that Geller has been caught cheating and his performances can be duplicated by stage magic tricks. In 1975, Geller published his first autobiography, My Story, and acknowledged that, in his early career, his manager talked him into adding a magic trick to make his performances last longer. This trick involved Geller appearing to guess audience members' license plate numbers, when in fact his manager had given them to him ahead of time. One of Geller's most prominent critics is the skeptic James Randi, who has accused Geller repeatedly of trying to pass off magic tricks as paranormal displays. Randi often duplicated Geller's performances using stage magic techniques. By the mid-1980s Geller was described as "a millionaire several times over", and claimed to be performing mineral dowsing services for mining groups at a standard fee of £1 million. In June 1986 the Australian Skeptic reported that Geller had been paid A$350,000 and granted an option of 1,250,000 Zanec shares at 20c each until 5 June 1987. Geller starred in the horror film Sanitarium (2001), directed by Johannes Roberts and James Eaves. In May 2002, he appeared as a contestant on the first series of the British reality TV show I'm a Celebrity...Get Me Out of Here!, where he was the first to be eliminated and finished in last place. In 2005, Geller starred in Uri's Haunted Cities: Venice, a XI Pictures/Lion TV production for Sky One, which led to a behind the scenes release in early 2008 called Cursed; both productions were directed by Jason Figgis. In early 2007, Geller hosted a reality show in Israel called The Successor (היורש), where the contestants supposedly displayed supernatural powers; Israeli magicians criticized the program saying that it was all magic tricks. In July 2007 NBC signed Geller and Criss Angel for Phenomenon, to search for the next great mentalist; contestant Mike Super won the position. In January 2008, Geller began hosting the TV show The Next Uri Geller, broadcast by Pro7 in Germany. In February 2008, Geller began a show on Dutch television called De Nieuwe Uri Geller, which shares a similar format to its German counterpart. The goal of the programme is to find the best mentalist in the Netherlands. In March 2008, he started the same show in Hungary (A kiválasztott in Hungarian). During the show, Geller speaks in both Hungarian and English. Geller also performs his standard routines of allegedly making stopped watches start, spoons jump from televisions, and tables move. Geller co-produced the TV show Book of Knowledge, released in April 2008. In October 2009, a similar show, called The Successor of Uri Geller, aired on Greek television. Geller has claimed his feats are the result of paranormal powers given to him by extraterrestrials, but critics such as James Randi have shown that Geller's tricks can be replicated with stage magic techniques. In the early 1970s, an article in The Jerusalem Post reported that a court had ordered Geller to refund a customer's ticket price and pay court costs after finding that he had committed fraud by claiming that his feats were telepathic. In addition, a 1974 article also hints at Geller's abilities being trickery. The article alleged that his manager Shipi Shtrang and Shipi's sister Hannah Shtrang secretly helped in Geller's performances. Eventually, Geller married Hannah and they had children. The parapsychologist Andrija Puharich met Geller in 1971 and endorsed him as a genuine psychic. Under hypnosis, Geller claimed he was sent to earth by extraterrestrials from a spaceship fifty-three thousand light years away. Geller would later deny the space-fantasy claims, but affirmed there "is a slight possibility that some of my energies do have extraterrestrial connection." Puharich also stated that Geller teleported a dog through the walls of his house. However, science writer Martin Gardner wrote as "no expert on fraud was there as an observer" then nobody should take the claim of Puharich seriously. In his biography of Geller, Uri: A Journal of the Mystery of Uri Geller (1974) Puharich claimed that with Geller he had communicated with super intelligent computers from outer space. According to Puharich the computers sent messages to warn humanity that a disaster is likely to occur if humans do not change their ways. The psychologist Christopher Evans who reviewed the book in the New Scientist, wrote that although Puharich believed in every word he had written, the book was credulous and "those fans of Geller's who might have hoped to have used the book as ammunition to impress the sceptics. They will be the most disappointed of all". Randi has written the biography contained "silly theories" but was "both a boost and a millstone to Geller". Geller's spoon bending feats are discussed in The Geller Papers (1976), edited by Charles Panati. There was controversy when it was published. Several prominent magicians came forward to demonstrate that Geller’s so-called psychic talents could be easily duplicated by stage magic. Martin Gardner wrote that Panati had been fooled by Geller's trickery and The Geller Papers were an "embarrassing anthology". Many scientists, magicians, and skeptics have suggested possible ways in which Geller could have tricked his audience by using misdirection techniques. These critics, who include Richard Feynman, James Randi and Martin Gardner, have accused him of using his demonstrations fraudulently outside of the entertainment business. Nobel Prize-winning physicist Richard Feynman, who was an amateur magician, wrote in Surely You're Joking, Mr. Feynman! (1985) that Geller was unable to bend a key for him and his son. Some of his claims have been described by watchmakers as simply restarting a stopped mechanical clock by moving it around. Geller is known for making predictions regarding sporting events. During the Euro 96 football match between Scotland and England at Wembley, Geller, who was hovering overhead in a helicopter, claimed that he managed to move the ball from the penalty spot when Scotland's Gary McAllister was about to take a penalty kick; the penalty kick was saved and Scotland lost 2–0. In another instance, in 1992, Geller was asked to investigate the kidnapping of Hungarian model Helga Farkas: he predicted she would be found alive and in good health, but she was never found and is widely believed to have been murdered by her kidnappers. Geller was a friend of Bruce Bursford and helped him "train his mind" during some cycling speed record-breaking bids in the 1990s. Since the publication of his first book, My Story in 1975, he claimed that his wealth originated from being commissioned as a mineral-dowser and not from bending spoons and forks. In 2007, skeptics observed that Geller appeared to have dropped his claims that he does not perform magic tricks. Randi highlighted a quotation from the November 2007 issue of the magazine Magische Welt (Magic World) in which Geller said: "I'll no longer say that I have supernatural powers. I am an entertainer. I want to do a good show. My entire character has changed." In a later interview, Geller told Telepolis, "I said to this German magazine, so what I did say, that I changed my character, to the best of my recollection, and I no longer say that I do supernatural things. It doesn't mean that I don't have powers. It means that I don't say 'it's supernatural', I say 'I'm a mystifier!' That's what I said. And the skeptics turned it around and said, 'Uri Geller said he's a magician!' I never said that." In that interview, Geller further explained that when he is asked how he does his stunts, he tells children to "Forget the paranormal. Forget spoon bending! Instead of that, focus on school! Become a positive thinker! Believe in yourself and create a target! Go to university! Never smoke! And never touch drugs! And think of success!" In March 2019, The Guardian reported that Geller wrote an open letter to British Prime Minister Theresa May, stating that he will telepathically prevent her from leading Britain out of the European Union. in Geller's words "As much as I admire you, I will stop you telepathically from doing this – and believe me I am capable of executing it." Geller admits, "Sure, there are magicians who can duplicate [my performances] through trickery." He has claimed that even though his spoon bending can be repeated using trickery, he uses psychic powers to achieve his results. James Randi has stated that if Geller is truly using his mind to perform these feats, "He is doing it the hard way." Stage magicians note several methods of creating the illusion of a spoon spontaneously bending. Most common is the practice of misdirection, an underlying principle of many stage magic tricks. There are many ways in which a bent spoon can be presented to an audience as to give the appearance it was manipulated using supernatural powers. One way is through brief moments of distraction in which a magician can physically bend a spoon unseen by the audience, before gradually revealing the bend to create the illusion that the spoon is bending before the viewers' eyes. Another way is to pre-bend the spoon, perhaps by heating it, reducing the amount of force that needed to be applied to bend it manually. Watchmakers have noted that "many supposedly broken watches had merely been stopped by gummy oil, and simply holding them in the hand would warm the oil enough to soften it and allow watches to resume ticking." In 1978, Yasha Katz, who had been Geller's manager in Britain, said that all performances by Geller were simply stage tricks, and he explained how they were really done. In November 2008, Geller accepted an award during a convention of magicians, the Services to Promotion of Magic Award from the Berglas Foundation. In his acceptance speech, Geller said that if he had not had psychic powers then he "must be the greatest" to have been able to fool journalists, scientists and Berglas himself. In October 2012, Geller gave a lecture for magicians in the United States at the Genii Magazine 75th Birthday Bash. 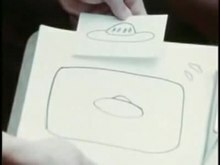 This clip, created by the Stanford Research Institute, shows Uri Geller performing drawing experiments for researchers. Geller's performances of drawing duplication and cutlery bending usually take place under informal conditions such as television interviews. During his early career, he allowed some scientists to investigate his claims. A study was commissioned by the United States Defense Intelligence Agency as part of the Stargate Project and conducted during August 1973 at Stanford Research Institute (now known as SRI International) by parapsychologists Harold E. Puthoff and Russell Targ. Geller was isolated and asked to reproduce simple drawings prepared in another room. The experimenters concluded that Geller had "demonstrated his paranormal perceptual ability in a convincing and unambiguous manner". Writing about the same study in a 1974 article published in the journal Nature, they concluded that he had performed successfully enough to warrant further serious study, coining the term "Geller effect" to refer to the particular type of abilities they felt had been demonstrated. In An Encyclopedia of Claims, Frauds, and Hoaxes of the Occult and Supernatural, Randi wrote: "Hal Puthoff and Russell Targ, who studied Mr. Geller at the Stanford Research Institute were aware, in one instance at least, that they were being shown a magician's trick by Geller." Moreover, Randi explained, "their protocols for this 'serious' investigation of the powers claimed by Geller were described by Ray Hyman, who investigated the project on behalf of the Department of Defense's Advanced Research Projects Agency, as 'sloppy and inadequate.'" Critics have pointed out that both Puthoff and Targ were already believers in paranormal powers and Geller was not adequately searched before the experiments. The psychologist C. E. M. Hansel and skeptic Paul Kurtz have noted that the experiments were poorly designed and open to trickery. Critics of the experiments include psychologists David Marks and Richard Kammann, who published a description of how Geller could have cheated in an informal test of his so-called psychic powers in 1977. Their 1978 article in Nature and 1980 book The Psychology of the Psychic (2nd ed. 2000) described how a normal explanation was possible for Geller's alleged psychic powers. Marks and Kammann found evidence that while at SRI, Geller was allowed to peek through a hole in the laboratory wall separating Geller from the drawings he was being invited to reproduce. The drawings he was asked to reproduce were placed on a wall opposite the peep hole which the investigators Targ and Puthoff had stuffed with cotton gauze. In addition to this error, the investigators had also allowed Geller access to a two-way intercom enabling Geller to listen to the investigators' conversation during the times when they were choosing and/or displaying the target drawings. These basic errors indicate the high importance of ensuring that psychologists, magicians or other people with an in-depth knowledge of perception, who are trained in methods for blocking sensory cues, be present during the testing of psychics. Marks, after evaluating the experiments, wrote that none of Geller's paranormal claims had been demonstrated in scientifically controlled conditions, concluding that "Geller has no psychic ability whatsoever. However, I believe him to be a very clever, well-practiced magician." To Geller's astonishment, he was immediately booked on The Merv Griffin Show. He was on his way to becoming a paranormal superstar. 'That Johnny Carson show made Uri Geller,' Geller said. To an enthusiastically trusting public, his failure only made his gifts seem more real: If he were performing magic tricks, they would surely work every time. As part of a mass demonstration, Geller’s photograph appeared on the cover of the magazine ESP with the caption "On Sept. 1, 1976 at 11pm E.D.T. THIS COVER CAN BEND YOUR KEYS." According to editor Howard Smukler, over 300 positive responses were received, many including bent objects and detailed descriptions of the surrounding circumstances including the bending of the key to the city of Providence, Rhode Island. Television presenter Noel Edmonds often used hidden cameras to record celebrities in Candid Camera-like situations for his television programme, Noel's House Party. In 1996, Edmonds planned a stunt in which shelves would fall from the walls of a room while Geller was in it. The cameras recorded footage of Geller from angles he was not expecting, and they showed Geller grasping a spoon firmly with both hands as he stood up to display a bend in it. In late 2006 and early 2007, Geller starred in The Successor, an Israeli television show to find his "successor." During one segment, a compass was made to move, apparently as a result of Geller's paranormal abilities. However, critics say slow motion footage of the episode showed Geller attaching a magnet to his thumb immediately prior to the compass's movement. Geller denied that this was sleight of hand, and said he welcomed the "mystical aura" that the publicity gave him. Geller performed the same compass trick in 2000 on ABC TV's The View, which was later duplicated by Randi on the same show the following week. Geller has litigated or threatened legal action against some of his critics with mixed success. These included libel allegations against James Randi and illusionist Gérard Majax. In 1971, a mechanical engineering student called Uri Goldstein attended one of Geller's shows, and subsequently sued the show's promoters for breach of contract. He complained that Geller had promised a demonstration of several psychic powers but had delivered only sleight-of-hand and stage tricks. The case came before the civil court in Beersheba. Geller was not present as the summons had been sent to the office of the promoter Miki Peled, who had ignored it as being trivial. Goldstein was awarded 27.5 lira (around $5) for breach of contract. Later, Goldstein admitted that he went to the show specifically with the intention of suing to get his money back, and he had already found a lawyer to represent him prior to attending the performance. In a 1989 interview with a Japanese newspaper, James Randi was quoted as saying that Geller had driven a scientist to "shoot himself in the head" after finding out that Geller had fooled him. Randi afterwards claimed it was a metaphor lost in translation. The story was also repeated in a Canadian newspaper, which quoted Randi as saying essentially the same thing: "One scientist, a metallurgist, wrote a paper backing Geller's claims that he could bend metal. The scientist shot himself after I showed him how the key bending trick was done." In 1990, Geller sued Randi in a Japanese court over the statements published in the Japanese newspaper. Randi claims that he could not afford to defend himself, therefore he lost the case by default. The court declared Randi's statement an "insult" as opposed to libel, and awarded a token judgement against him, paying Geller only "one-third of one-percent of what he'd demanded". Since the charge of "insult" is only recognized in Chinese and Japanese law, Randi was not required to pay. Later in 1995 Geller agreed not to pursue payment of the Japanese fine. Randi maintains that he has never paid even one dollar or even one cent to Geller. In 1992, Geller filed a $15 million suit against Randi and CSICOP for statements made in an International Herald Tribune interview on 9 April 1991, but he was unsuccessful because the statute of limitations had expired. In 1994 Geller asked to dismiss without prejudice, and he was ordered to pay $50,000 for the publisher's attorney fees. After not paying in time, Geller was sanctioned with an additional $20,000. Due to the sanction, the suit was dismissed with prejudice, which, according to Randi's attorneys, means that Geller cannot pursue the same suit in any other jurisdiction. In 1995 Geller and Randi announced that this settled "the last remaining suits" between him and the CSICOP. As part of the settlement, Geller agreed not to pursue the payment of the 1990 Japanese ruling, in exchange for Prometheus Books inserting an errata on all future editions of Physics and Psychics, correcting erroneous statements made about Geller. In 1991, Geller sued Timex Corporation and the advertising firm Fallon McElligott for millions in Geller v. Fallon McElligott over an ad showing a person bending forks and other items, but failing to stop a Timex watch. Geller was sanctioned $149,000 for filing a frivolous lawsuit. In 1998, the Broadcasting Standards Commission (BSC) in the United Kingdom rejected a complaint made by Geller, saying that it "wasn't unfair to have magicians showing how they duplicate those 'psychic feats'" on the UK Equinox episode "Secrets of the Super Psychics". He also considered a suit against IKEA over a furniture line featuring bent legs that was called the "Uri" line. In November 2000, Geller sued video game company Nintendo for £60 million over the Pokémon species "Yungera", localized in English as "Kadabra", which he claimed was an unauthorized appropriation of his identity. The Pokémon in question has psychic abilities and carries a bent spoon. Geller also claimed that the star on Kadabra's forehead and the lightning patterns on its abdomen are symbolisms popular with the Waffen SS of Nazi Germany. The katakana for the character's name, ユンゲラー, is visually similar to the transliteration of Geller's own name into Japanese (ユリゲラー). He is quoted as saying: "Nintendo turned me into an evil, occult Pokémon character. Nintendo stole my identity by using my name and my signature image." As of 2008, the situation was still ongoing. Pokémon anime director and storyboard artist Masamitsu Hidaka confirmed in an interview that Kadabra would not be used on a Pokémon Trading Card until an agreement was reached on the case. As of 2019, the agreement has not been reached and the last Kadabra card released was in the Skyridge e-Reader set (2002/2003). In 2007, Geller issued a DMCA notice to YouTube to remove a video uploaded by Brian Sapient of the "Rational Response Squad" which was excerpted from an episode of the Nova television program titled "Secrets of the Psychics". The video included footage of Geller failing to perform. In response, Sapient contacted the Electronic Frontier Foundation, issued a DMCA counter-notice, and sued Geller for misuse of the DMCA. Geller's company, Explorologist, filed a counter-suit. Both cases were settled out of court; a monetary settlement was paid (but it is not clear by and to whom) and the eight seconds of footage owned by Explorologist were licensed under a noncommercial Creative Commons license. On 11 February 2009, Geller purchased the uninhabited 100-meter-by-50-meter Lamb Island off the eastern coast of Scotland, previously known for its witch trials, and beaches that Robert Louis Stevenson is said to have described in his novel Treasure Island. Geller claims that buried on the island is Egyptian treasure, brought there by Scota, the mythological half-sister of Tutankhamen in Irish mythology, 3,500 years ago. He claimed that he will find the treasure through dowsing, despite dowsing being considered a pseudoscience. Geller also claimed to have strengthened the mystical powers of the island by burying there a crystal orb once belonging to Albert Einstein. In 2014, a 12 foot tall statue of a gorilla made from approximately 40,000 metal spoons was unveiled in Geller's Berkshire garden by the Duke of Kent, with the intention of possibly relocating it to Great Ormond Street Hospital. The statue was welded by sculptor Alfie Bradley, and funded by the British Ironworks Centre of Oswestry. According to Bradley, many of the spoons were donated by schoolchildren from around the world. Speaking at the unveiling, Geller said "This will not raise money for charity. It will do something better. It will amaze sick children." In 2013, a BBC documentary, The Secret Life of Uri Geller – Psychic Spy? featured Uri Geller, Benjamin Netanyahu, Christopher 'Kit' Green, Paul H. Smith, Harold Puthoff and Russell Targ. The documentary claimed Geller became a "psychic spy" for the CIA, was recruited by Mossad, and worked as an "official secret agent" in Mexico, being a frequent guest of President José López Portillo. In the film, Geller claims to have erased floppy discs carried by KGB agents by repeatedly chanting the word "erase". Geller has lived in Jaffa in Israel since 2015. He previously lived in the village of Sonning-on-Thames, Berkshire, in the United Kingdom. He is trilingual, speaking fluent Hebrew, Hungarian and English. In an appearance on Esther Rantzen's 1996 television talk show Esther, Geller declared that he had suffered from anorexia nervosa and bulimia for several years. He has written 16 fiction and non fiction books. His friend Michael Jackson was best man when Geller renewed his wedding vows in 2001. Geller also negotiated the TV interview between Jackson with the journalist Martin Bashir, Living with Michael Jackson. Geller is president of International Friends of Magen David Adom, a group that lobbied the International Committee of the Red Cross to recognise Magen David Adom ("Red Star of David") as a humanitarian relief organisation. In 1997 he tried to help the Second Division football club Exeter City win a crucial end of season game by placing "energy-infused" crystals behind the goals at Exeter's ground (Exeter lost the game 5–1); he was appointed co-chairman of the club in 2002. The club was relegated to the Football Conference in May 2003, where it remained for five years. He has since severed formal ties with the club. He had also been involved with Reading F.C. and claimed in 2002 that he had helped them to avoid relegation by getting the club's supporters to look into his eyes and say "win, Reading, win". Reading manager Alan Pardew dismissed Geller's role in the club's survival – which was achieved thanks to a draw in the crucial match rather than a Reading victory – stating "as soon as we get a bit of joy, thanks to all the hard work and efforts of my staff and players, he suddenly comes out of the blue and tries to claim the limelight." Following the death of Michael Jackson, the British ITV network broadcast an interview with Geller about his association with Jackson, entitled My Friend Michael Jackson: Uri's Story, in July 2009. ^ A two-minute clip of this documentary with the Geller segment has been widely circulated on the Internet since James Randi acquired permission to use it from NBC, and Carson paid for the expensive, complex videotape transfer. ^ "Uri Geller". Paranormalist. Retrieved 27 February 2015. ^ Millis, Joe (23 May 2015). "Israeli psychic Uri Geller thinks he can save Newcastle Utd from relegation to Championship". Yahoo! Sport. Archived from the original on 20 June 2015. Retrieved 6 June 2015. ^ a b Randi, James (6 April 1978). "Geller a fake says ex-manager". New Scientist. 78 (1097): 11. ^ Reply letter: Geller, Uri (1 June 1978). "Geller replies". 78 (1105): 614. ^ Swann, Yvonne (12 February 2010). "Me and my school photo: Uri Geller remembers bombs, curfews and shootings in Cyprus". Mail Online. ^ Margolis, Jonathan (1998) Uri Geller Magician or Mystic, Orion Publishing Group, p. 13, ISBN 0-7528-1006-5. ^ Randi, James(1982) The Truth About Uri Geller, New York: Prometheus Books, p. 9, ISBN 0-87975-199-1. ^ Margolis, Jonathan (29 December 1999). "Nintendo faces £60m writ from Uri Geller". Guardian Unlimited. London: Guardian News and Media Limited. Retrieved 9 December 2006. ... the 53-year-old former Israeli paratrooper has always guarded unlicensed use of his name. ^ a b Geller, Uri (8 November 2000). "Geller: I can bend metal". London: The Guardian. Retrieved 17 October 2007. ^ "Cyberspace Psychic". Totally Jewish. 25 July 2000. Retrieved 5 October 2007. ^ a b c "The skeptic's Dictionary: Uri Geller". Skepdic.com. Retrieved 7 March 2010. ^ Nickell, Joe. (2005). Camera Clues: A Handbook for Photographic Investigation. University Press of Kentucky. pp. 198–200. ISBN 0-8131-1894-8 "Skeptics point out that Geller is a former magician, that magicians can duplicate his effects by clever tricks, and that he refuses to perform when magicians are observing-apparently afraid they might discover his trickery. In fact Geller has actually been caught cheating. In one instance, although he pretended to cover his eyes while a secretary made a simple drawing, Geller actually peeked, thus enabling him to appear to read her mind and produce the drawing. Again, instead of bending a key "by concentration" as he pretended, Geller bent the key against a table when he thought no one was looking." ^ a b Hurley, Patrick J. (2010). A Concise Introduction to Logic. 11th Edition. Wadsworth Publishing. p. 626. ISBN 978-0840034168 "In fact Geller was just a clever trickster who duped his audiences. Geller's trickery was exposed in large measure by the magician James Randi. After watching videotapes of Geller's performances, Randi discovered how Geller performed his tricks, and in no time he was able to perform every one of them himself. Sometimes Geller would prepare a spoon or key beforehand by bending it back and forth several times to the point where it was nearly ready to break. Later, by merely stroking it gently, he could cause it to double over. On other occasions Geller, or his accomplices, would use sleight-of-hand maneuvers to substitute bent objects in the place of straight ones." ^ "13". Uri-geller.com. Retrieved 7 March 2010. ^ a b Alcock, James. (1981). Parapsychology-Science Or Magic? : A Psychological Perspective. Pergamon Press. pp. 139–40. ISBN 978-0080257730 "It was through the diligent efforts of conjurer James ("The Amazing") Randi that Geller was finally, at least in most people's eyes, exposed. Randi demonstrated that he could by ordinary conjuring means duplicate Geller's feats. His perseverance in investigating and unveiling the circumstances of many of Geller's more spectacular performances (including the discovery of confederates who aided Geller when necessary) made it very difficult for anyone with any degree of critical thought to continue to accept Geller's claims." ^ van Hattam, Margaret (18 January 1986). "A cost-effective account of the spoons". The Financial Times. In 1974 the late Sir Val Duncan set a young Israeli the task of finding some bottles of olive oil he had buried in the garden of his Majorca home, assuring him that it would be his first step towards untold wealth. He was right. Today Uri Geller is a millionaire several times over. This is how it happened. ^ The Skeptic, 2.6.86, 6. Cited in Bob Couttie, Forbidden Knowledge: The Paranormal Paradox (Cambridge: Lutterworth Press, 1988). ^ "Uri Geller accused of TV trickery". BBC. 21 January 2007. Retrieved 30 March 2007. ^ "NBC Offers Reality Show For Wanna-Be Mentalists With Uri Geller, Criss Angel". Tampa Tribune. 17 July 2007. Archived from the original on 20 October 2007. Retrieved 7 August 2007. ^ "The Next Uri Geller". Pro7. Retrieved 8 January 2008. ^ Hopewell, John (31 March 2008). "Knowledge powers Mip TV slate". Variety. ^ "Ο ΔΙΑΔΟΧΟΣ ΤΟΥ URI GELLER". Antenna.gr. 30 December 2009. ^ a b Frum, David (2000). How We Got Here: The '70s. New York, New York: Basic Books. p. 132. ISBN 0-465-04195-7. ^ Randi, James (30 April 2004). "Boring, Boring, Boring". James Randi Educational Foundation. Archived from the original on 10 July 2009. Retrieved 17 January 2008. ^ Samuel, Lawrence. (2011). Supernatural America: A Cultural History. Praeger. pp. 100–01. ISBN 978-0313398995 "After meeting Geller in Israel in 1971, Puharich was so taken with the twenty-three-year-old and his powers that he would describe the man in Messianic terms. More than just a particularly gifted psychic, Geller was an ambassador sent by extraterrestrials (from a spaceship called Spectra located some fifty-three thousands light years away) to prepare Earthlings for the conquest of their planet." ^ Kurtz, Paul. (1985). A Skeptic's Handbook of Parapsychology. Prometheus Books. p. 211. ISBN 0-87975-300-5 "Hypnotized by Puharich, Geller identified himself as "Spectra," a computer aboard a spaceship from a distant galaxy. Under the control of "Hoova," he was sent to intervene on earth and Puharich was to assist Geller. How much of this was due to Puharich's or Geller's fantasies and how much was a result of pure fabrication on the part of both is difficult to say. The "intelligences" that Uri drew upon were from outer space. For many, UFOlogy has become a new religion, replete with science-fiction imagery of the post-modern world. And Uri, like countless others, has embellished his mission with fanciful space-age symbols." ^ Shepard, Leslie. (1991). "Uri Geller". In Encyclopedia of Occultism & Parapsychology. Gale Research. p. 655. ISBN 0-8103-4915-9 "Although much of his [Puharich's] book was accurate factual reporting, many people were put off by the space-fantasy passages, and I admit that they caused me some embarrassment... You must remember that all of this fantasy material was obtained while I was under hypnosis. One reason I wrote My Story was to give my own version of events, though I must emphasize that there is a slight possibility that some of my energies do have extraterrestrial connection." ^ Gardner, Martin (2003). Are Universes Thicker Than Blackberries?. W.W. Norton & Co. pp. 244–45. ISBN 9780393057423. ^ "Richard Feynman on Uri Geller". Indian-skeptic.org. 23 October 1997. Retrieved 7 March 2010. ^ "Scots pyramid island a bargain for psychic Uri". Express.co.uk. 12 February 2009. Retrieved 7 March 2010. ^ "Húsz éve tűnt el Farkas Helga". delmagyar.hu. ^ Record-breaking cyclist killed. BBC News (10 February 2000). Retrieved on 2013-08-17. ^ Uri Geller, My Story (New York: Praeger, 1975). Uri Geller, Uri Geller's Fortune Secrets (London: Sphere, 1987). ^ Randi, James (18 January 2008). "Geller Reversal". James Randi Educational Foundation. ^ a b "Forget the paranormal!". Telepolis. 5 February 2008. ^ Association, Press (22 March 2019). "Uri Geller promises to stop Brexit using telepathy". The Guardian. ISSN 0261-3077. Retrieved 25 March 2019. ^ a b "Uri Geller – A Sceptical Perspective". WordSmith. October 1996. Archived from the original on 24 December 2012. Retrieved 12 October 2006. ^ a b c d Interview with James Randi in NOVA episode, "Secrets of the Psychics". ^ "Service To Magic Award". Retrieved 3 December 2008. Lets say I wasn’t real, lets say for the last years I’ve fooled the journalists, the scientists, my family, my friends... You... If I managed to fool them, I must be the greatest...I cannot bend spoons like some of the magicians, you, can, it blows my mind when I see that, I have no idea. I had the idea and cheekiness to call it psychic, in fact all I wanted was to be rich and famous. ^ Larimer, Sarah. "That time the CIA was convinced a self-proclaimed psychic had paranormal abilities". Washington Post. Washington Post. Retrieved 20 January 2017. ^ "Experiments – Uri Geller at SRI, August 4–11, 1973" (PDF). Central Intelligence Agency. Retrieved 19 January 2017. ^ "CIA releases 13m pages of declassified documents online". BBC. 18 January 2017. Retrieved 18 January 2017. ^ Targ, R.; Puthoff, H. (1974). "Information transmission under conditions of sensory shielding". Nature. 251 (5476): 602–07. doi:10.1038/251602a0. PMID 4423858. ^ "The Geller Papers". UriGeller.com. 2007. Retrieved 28 March 2007. ^ a b Randi, James (1995). "An Encyclopedia of Claims, Frauds, and Hoaxes of the Occult and Supernatural". St. Martin's Press. Archived from the original on 11 July 2009. Retrieved 28 March 2007. ^ Samuel, Lawrence R. (2011). Supernatural America: A Cultural History. Praeger. p. 101. ISBN 978-0-313-39899-5 "The observers were more appalled, however, than impressed. The SRI staffers (physicists Russell Targ and Harold Puthoff, who specialized in lasers) “already believed in E.S.P., and therefore their goal was to make Geller as comfortable as possible in order to make him produce it” said one of the independent experts, Ray Hyman. Hyman, a University of Oregon psychologist (and amateur magician), added that the think tank’s work was “incredibly sloppy”. Geller was not psychic but a very gifted conjurer, Hyman concluded, employing classic mentalist’s tricks that would and should have been exposed by more objective methods. Over the course of his six-week stint at SRI (for which he was paid 100$ a day and all expenses), Geller had not even been searched for magnets, something that any good researcher would have known to do to instantly identify a fake. A magnet taped to one’s leg could make a Geiger counter click wildly, this a feat Geller had performed before researchers at the University of London who had been hoodwinked by the man." ^ Kurtz, Paul. (1985). A Skeptic's Handbook of Parapsychology. Prometheus Books. p. 213. ISBN 0-87975-300-5 "Skeptics have criticized the test for lacking stringent controls. They have pointed out that the pictures drawn by Geller did not match what they were supposed to correspond to but appeared, rather, to be responses to verbal cues. What constituted a “hit” is open to dispute. The conditions under which the experiments were conducted were extremely loose, even chaotic at times. The sealed room in which Uri was placed had an aperture from which he could have peeked out, and his confederate Shipi was in and about the laboratory and could have conveyed signals to him. The same was true in another test of clairvoyance, where Geller passed twice but surprisingly guessed eight out of ten times the top face of a die that was placed in a closed metal box. The probability of this happening by chance alone was, we are told, one in a million. Critics maintained that the protocol of this experiment was, again, poorly designed, that Geller could have peeked into the box, and that dozens of other tests from which there were no positive results were not reported." ^ Marks, D.; Kammann, R. (1978). "Information transmission in remote viewing experiments". Nature. 274 (5672): 680. doi:10.1038/274680a0. ^ "Swift". 30 March 2007. Archived from the original on 11 July 2009. Retrieved 22 December 2007. ^ JREF. "James Randi – Secrets of the Psychics Documentary (Full)". YouTube. Retrieved 25 August 2017. ^ a b Higginbotham, Adam. "The Unbelievable Skepticism of the Amazing Randi". New York Times. Retrieved 25 August 2017. ^ "Geller Experiment Successful – ESP Magazine". Zem.demon.co.uk. Archived from the original on 1 September 2007. Retrieved 7 March 2010. ^ "James Randi exposes Uri Geller". YouTube. Retrieved 27 July 2010. Excerpt from "James Randi's Solved Mysteries Workshop", a talk given by Randi during the 1998 Skeptics Society Convention. ^ "James Randi's Swift". Randi.org. 9 February 2007. Archived from the original on 10 July 2009. Retrieved 7 March 2010. ^ "Entertainment | Uri Geller accused of TV trickery". BBC News. 21 January 2007. Retrieved 7 March 2010. ^ Randi, James (26 January 2000). "The Moving Compass Trick". James Randi Educational Foundation. Archived from the original on 10 July 2009. Retrieved 30 March 2007. ^ Randi, James (1982) The Truth About Uri Geller, Prometheus Books, pp. viii, 198, 215, ISBN 0-87975-199-1. Randi quotes "Legerdemain ruled breach of contract", Jerusalem Post, 5 January 1971. Quoted in An Apology from James Randi Urigeller.com. ^ a b c "Randi's Geller Hotline for 1994: Recent Legal Developments". Randi.org. 11 December 1994. Archived from the original on 24 June 2007. Retrieved 7 March 2010. ^ a b c "PSI Researcher". Uri-geller.com. Retrieved 7 March 2010. ^ a b Randi, James (9 February 2007). "More Geller Woo-Woo". SWIFT Newsletter. James Randi Educational Foundation. Archived from the original on 10 July 2009. Retrieved 29 January 2007. ^ Geller, Uri (August 1994). "Uri Geller Libel Suit Dismissed". Committee for Skeptical Inquiry. Archived from the original on 11 February 2008. Retrieved 8 December 2006. Self proclaimed "psychic" Uri Geller had to dismiss a multi-million dollar libel suit and has to pay over $20,000 in sanctions in an action he brought against skeptical book publisher Prometheus Books of Amherst, New York. ^ Blackmore, Susan (November – December 1998). "UK broadcast commission rejects Geller's 'Secrets of the Psychics' complaint". Skeptical Inquirer. Archived from the original on 26 May 2006. Retrieved 11 March 2007. ^ "Broadcasting Standards Commission". Openmedia.co.uk. 17 June 1998. Retrieved 7 March 2010. ^ Margolis, Jonathan (29 December 1999). "Nintendo faces £60m writ from Uri Geller". London: Guardian Unlimited. Retrieved 10 July 2007. ^ "Uri Geller sues Pokemon". Retrieved 30 May 2007. ^ a b c "Geller sues Nintendo over Pokémon". BBC News. 2 November 2000. Retrieved 30 May 2007. ^ Sahagian, Jon (4 July 2008). "Second Interview with Masamitsu Hidaka – Many Interesting Points!". PokéBeach. Retrieved 4 March 2016. ^ Wall Street Journal, 23 August 2010, 1. The article quoted Geller as saying that "I'm certain there are ancient Egyptian artifacts there. It's only a matter of time until we find them." ^ "Spoon-bender buys Scottish island". BBC News. 11 February 2009. ^ "Uri Geller spoon gorilla completed". 1 May 2014 – via www.bbc.co.uk. ^ "Uri Geller spoon gorilla unveiled". 17 May 2014 – via www.bbc.co.uk. ^ "Spring Films entry". Archived from the original on 28 October 2014. ^ "The Secret Life of Uri Geller". BBC Two. ^ Simons, Jake Wallace (21 July 2013). "The Secret Life of Uri Geller, BBC Two, review". The Telegraph. Retrieved 8 September 2014. ^ Woods, Judith (11 March 2017). "Uri Geller: 'The CIA wanted to turn me into a Cold War weapon'". The Telegraph. ^ Maltz, Judy (8 September 2015). "Spoon-bending Psychic Uri Geller Coming Home to Israel". Haaretz. ^ "Uri Geller mystified by letterbox on Thames Sonning Bridge". BBC. 2013. Retrieved 27 February 2015. ^ "TV2V". Webcast.tv2.hu. Retrieved 7 March 2010. ^ "With Male Eating Disorders on the Rise, Uri Geller One of Few Advocates for Males". Glammonitor (New York, United States). 17 April 2015. ^ "Anorexic men are suffering in silence". Daily Record (Glasgow, Scotland). 1 January 1999. ^ Geller, Uri (20 April 2008). "Uri Geller: Bingeing is an addictive drug". London: The Daily Telegraph. ^ "Jackson fans await Geller wedding". BBC. 7 March 2001. Retrieved 30 March 2007. ^ "Jackson interview seen by 14m". BBC. 4 February 2003. Retrieved 30 March 2007. ^ "Geller's straight approach". 21 May 2002 – via news.bbc.co.uk. ^ "ITV announce 'My Friend Michael Jackson: Uri's Story' @ Unreality Primetime". Primetime.unrealitytv.co.uk. 17 July 2009. Archived from the original on 9 December 2009. Retrieved 7 March 2010. Gardner, Martin. Confessions of a Psychic. (under the pseudonym "Uriah Fuller" (an allusion to Geller) that purport to explain "how fake psychics perform seemingly incredible paranormal feats.") Karl Fulves, 1975. Gardner, Martin. Further Confessions of a Psychic. (under the pseudonym "Uriah Fuller") 1980. Guest appearance as a character in Daredevil #133 (May 1976), Let’s Level With Daredevil. Uri-geller.com. Retrieved on 10 June 2016. Broadcasting Standards Commission adjudication on Geller's complaint against TV programme "Secrets of the Psychics"
Colin Wilson Papers (2 document boxes) housed at the Eaton Collection of Science Fiction and Fantasy of the University of California, Riverside Libraries. This collection Includes original manuscripts and other materials written and collected by Wilson regarding Uri Geller.